traditional mid-eastern salad consisting of chopped parsley, tomatoes, green onions & cracked wheat all tossed in a dressing of freshly squeezed lemon and olive oil. pureed chick peas, tahini sauce & freshly squeezed lemon & garlic or with roasted red bell pepper and a dash of cayenne pepper. pureed roasted eggplant, tahini sauce (ground sesame seeds) and freshly squeezed lemon and garlic. tender baby eggplant baked in a light tomato sauce and topped with roasted peppers. served with a creamy garlic herb sauce on the side. red lentils, rice, onions, carrots, parsley and spices. tomatoes, cucumbers and parsley tossed with lemon juice, garlic and oil. a large bowl of mixed greens, tomatoes, peppers, onions and cucumbers topped with sliced grilled chicken, toasted almonds and dried cranberries. creamy hoummos topped with tenderloin tips or chunks of marinated chicken and pine nuts. tender pieces of sauteed chicken breast on top of hashwi rice with toasted almonds and pine nuts. served over a filo cup. yellow squash stuffed with ground lamb and rice, cooked in tomato sauce. green beans stewed in a light tomato herb sauce. served with noodle rice. eggplant, squash, peppers, tomatoes, chick peas, onions and garlic. served with noodle rice. baked ground lamb with cracked wheat, onions & spices, stuffed with lamb, onions and pine nuts. served with rice & lubieh. eggplant topped with ground lamb, onions and spices cooked in a tomato sauce. choice of specially marinated chicken or lamb pieces, served on a bed of lettuce & tomatoes, topped with tahini sauce. choice of noodle rice or vegetables. lentils cooked with cracked wheat, caramelized onions and spices. thick and juicy breast of boneless, skinless chicken. served with sauteed vegetables or noodle rice or vegetables. tender chunks of tenderloin, seasoned and skewered with onions and green peppers. served with noodle rice or vegetables. 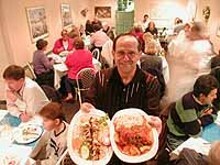 choice of three, grape leaves, chicken kabob, kafta, cabbage, or cooked kibby. choice of lamb or chicken shawarma rolled in a pita with tahini sauce, lettuce and tomato. falafil balls, lettuce, tomato, hoummos and tabbouleh rolled in a pitta. rolled pita stuffed with hoummos & tabbouleh. salmon with lettuce & tomato rolled in a pita served with tartar sauce. charbroiled kafta rolled in pita with tahini sauce, lettuce and tomato. grilled chicken breast with roasted red peppers, garlic sauce, lettuce and tomato. roasted eggplant, roasted red pepper, red onion and tomato. creamy feta dressing on the side. marinated chunks of beef tenderloins or chicken grilled with onions & green peppers rolled in pita bread. white rice with sauteed ground lamb, almonds, pine nuts and spices. sauteed ground lamb with onions, pine nuts, almonds and spices.